All eight months of this short lived publication, ‘dedicated to an upscale audience, the magazine promised attention to the “art of good living” and published articles on public banquets and social breakfasts’. Extremely rare, and bound in their original paper wrappers. A lovely copy of this delightful Almanach. A stunning example of beauty, finesse and luxury from the Art-Deco period. Only 1000 copies were printed and this is numbered 68. The hand-coloured illustrations are by Edouard Halouze and include four plates of the seasons as well as 17 full page plates which decorate the ‘Petit Guide de la Vie Elégante’ presented in the form of a collection of advertisements for the Moulin Bleu, Cartier, Prunier, Gaveau, les couturiers Raimon et Martial & Armand, etc. Suitably housed in a one of a kind, hand-tooled case by Bayntun-Riviere. The rare first edition of this essential work by the ‘father’ of California viticulture, a Hungarian nobleman who pioneered the finer vintages of California and was described as ‘a vade-mecum for success: brilliant, energetic, imaginative, personable and with a nose for money’. Clean and bright copy in the original cloth binding, with woodcut frontispiece of the author's home (Buena Vista Ranche, Sonoma County, California), and numerous woodcut illustrations throughout. The object of Haraszthy’s trip through ‘parts of France, the Netherlands, Holland, Rhenish, Prussia, Bavaria, Nassau, Baden, Switzerland, Spain, Italy and England’, was to examine the different varieties of grapes and the methods of making wine in the wine growing countries of Europe. It was sanctioned by Californian Governor J.G. Downey. ‘Aside from its historical value as a reference on 19th century European methods of viticulture and wine making, Haraszthy’s descriptions of the wines he drank, the towns he visited, the countryside through which he travelled and anecdotes of the people he met make for entertaining reading.’ - Gabler, Wine into Words. Putting all this in perspective, the California Gold Rush had just taken place, and as Haraszthy points out whilst traveling through Europe – ‘The Emperor Napoleon is at this moment in the bathing-place of Biarritz, about twenty minutes drive from here’. A scarce copy of this influential work. In the striking dust jacket. When Thea von Harbou became Fritz Lang's second wife in 1922, she'd already established herself as an important author and screenwriter. The idea for Metropolis emerged from a novella she'd written a few years previously. The finished novel of Metropolis was written while she (with assistance from Lang) worked on the screenplay, and published in German in 1926, with this, the first edition in English published in 1927, the year the film was released. Illustrated with thirteen photographs and twelve tipped in chromolithograph facsimiles of early California wine labels and trade cards. With six page prospectus laid in, and housed in the original slipcase. 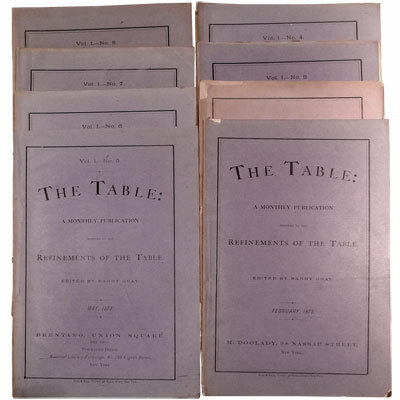 Includes 20 pages of tables showing the rate of farthings to l.s.d.f. 6 pages of ‘Tables of Interest’ - Showing the cost of borrowing at 3, 3.5, 4, and 5 percent, over periods ranging from one day to 12 months. Index incorrectly bound before tables. A large and comprehensive popular Victorian cookery book, 1300 pages of recipes together with detailed index. Illustrated with 12 full-page coloured plates and numerous illustrations in the text. 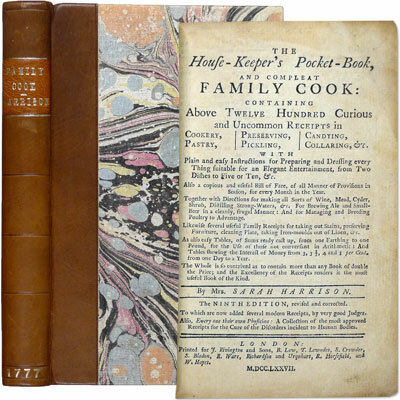 In addition to the many sections of recipes, there are sections on: Kitchen Processes, Food for Invalids and Infants, The Kitchen, and The Management and Duties of Servants.